We offer classes for all ages and levels. Whether you have a young child twirling around your living room, a grade-schooler who is ready for more focused instruction, or a teen wanting to try ballet for the first time, we have a class for you. In addition, we offer classes for adult beginners as well as intermediate and advanced adult and teen dancers. It is never to late to start or to rediscover ballet. Contact us to schedule a trial class. Students are placed in the most suitable class by age, experience, motivation, self-discipline, previous attendance, maturity, and physical development. Student's initial class serves as a placement audition. Promotion is based on assimilation of the current vocabulary and mastery of movements for each level, which usually requires more than one year's study. 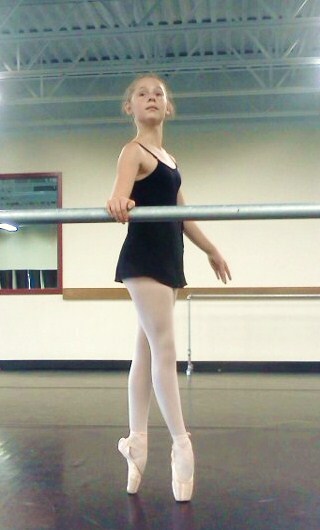 Pointe work begins at about age 11 after four years of training. Students wishing to pursue pointe work as a part of their ballet education should begin twice weekly attendance by age 9/10 - including summer! - and add a third weekly class in the second year of YIII. While pointe work is not for everyone, although very few students are physically inhibited, some may elect to just continue to enjoy dancing on soft shoes. Students are individually evaluated for readiness, and then attendance of three weekly ballet classes is REQUIRED.